DEF LEPPARD will celebrate the 30th anniversary of their epic album Hysteria with a remastered box set, out on August 4th. 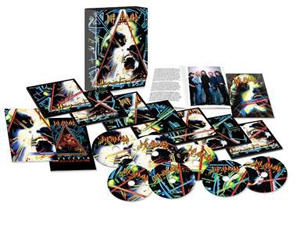 Prepared in conjunction with singer Joe Elliott, who has acted as executive producer on the set, and re-mastered by the band’s long-serving sound engineer Ronan McHugh, the 30th Anniversary Editions are a treasure trove for the true DEF LEPPARD fan. The 5CD/2DVD Super Deluxe Edition boasts four books — Story Of, Ross Halfin Photo Book, Discography, Hysteria Tour Program and vintage Tour Poster. It also includes b-sides, live tracks and the In The Round In Your Face (Live) concert audio, available on CD for the first time! Other formats include a 3CD Deluxe Edition and 1CD. The album also appears as a double vinyl release for the first time, on limited 2LP on black vinyl, and an exclusive orange vinyl LP, available only through the uDiscover store HERE. Essential listening for fans across the board, Hysteria is indisputably one of the most revered rock albums of all time, giving us anthems such as "Pour Some Sugar On Me", "Animal","Love Bites", "Hysteria", "Rocket" and "Armageddon It". Watch the video for a sneak peek inside the box set below.